All through a family operated, well-established residential solar installer. Want to know more before you switch? Check out our easy-to-understand guide showcasing everything you need to know! 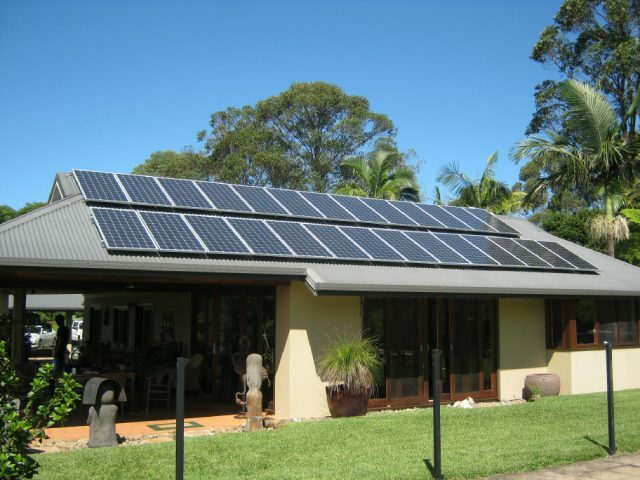 Grid connect solar is one of the most common solar system set-ups in Australia. It simply means that your system is connected to the mains electricity grid. Because of this, your system does not require the use of solar storage (i.e., batteries). Any excess electricity generated is fed back to the grid, where you will be credited a feed-in tariff by your electricity retailer (think Energex or Alinta Energy). In the Australian market, a ‘hybrid’ system simply describes a solar power system that connects to the grid and has a solar storage solution. This allows you to store any excess energy to use at night time, decreasing your electricity bill. Once the battery is fully charged, any excess energy produced is then fed into the grid. If you aren’t a big energy user, there’s the potential to EARN money from your solar system in this case. Although this isn’t the most common type of system in Australia, it’s the one we recommend most often to our customers. There are a few reasons for this: Firstly, we know that the Queensland Government is going to introduce more solar loans for batteries. Secondly, battery technology, whilst advancing, is still a heavy investment for a lot of homeowners. And thirdly, we want to sell the best possible solar system that is going to generate the biggest return for our customers. That could mean recommending a solar solution that doesn’t include a battery right now. We address all these issues by installing our customers with a high-quality solar system that is battery ready. So that when the government loans roll-out, or battery prices drop to a more affordable price, we’ll be around to install your brand new battery storage solution. Our expert solar advisor will evaluate your home’s potential for solar. They’ll use advanced imagery and discuss your electricity consumption. This will all be over in less than 10 minutes. After the call, our solar advisor will work to deliver you a tailor-made system. They will ensure you get the best possible return on your investment. Our solar advisors will then review the design and put together a proposal that highlights the costing, energy production and system specifications. You will receive a proposal from a leading residential solar installer (that's us). Customer satisfaction is our NUMBER ONE priority. If you require any tweaks or changes to our proposed design, say no more! Once the system and proposal designs are finalized, we organize a time that works for you to install your system. We provide you a lifetime of ongoing care and support. We will work tirelessly to ensure your system is always working to maximum capacity. The Queensland Government is continuing to offer interest-free loans for eligible customers. This loan can be used to purchase a solar energy system over a 7-year repayment term. If you are currently receiving Family Tax Benefit B, and meet other eligibility requirements, you can apply. Applications for the loan will close once funding is exhausted OR on 30th June 2019. Guidelines for eligibility can be found here. Omega Solar+Batteries is an eligible solar system supplier for this loan and can help you tackle increasing electricity costs. As we are an official partner with Brighte, you can purchase your solar through their no interest finance option. Omega Solar+Batteries are a registered vendor with Brighte, meaning you can enjoy a no deposit, no interest loan in order to switch to solar. Repayments don’t start until 2 weeks AFTER the installation of your system, and repayments can be managed hassle free using their official App. We can also offer the purchase of your solar system through Classic Funding Group. Once you complete a simple application process, you will be able to agree to repayment terms easily and start enjoying the savings your solar system brings you. Would recommend Omega Solar+Batteries to anyone interested in purchasing a Solar System. One of the things that impressed us the most was the friendly staff. The salesperson was so helpful. No pressure to sign here because this bargain price is only current for 24 hrs. How refreshing not to be pushed into signing straight away. After we did our own research we were certain that this type of investment is not worth compromising quality for cost. Ryan & Trev who did the installation were really fast, friendly and answered all of our questions. They cleaned up, showed us how the system worked and left with us knowing if we ever have an issue they are only a phone call away! Excellent service, excellent product, am really looking forward to getting a return on my 5kW investment, as well as doing my bit to be greener. Thanks guys, cheers!! Being on a pension is hard enough without the rising cost of electricity. We invested in a 1.5kW solar system last year and have just now had to pay our first electricity bill. We do have gas hot water and stove top but the first couple we were in credit for $15 and $24, this last bill we had to pay $32. So happy with the people at Omega Solar+Batteries and have recommended them to the people next door. If they do go ahead and purchase from Omega Solar+Batteries, we will get $50. Thank you. I’m so pleased I found Omega Solar+Batteries, I had 3 other companies out to give me a quote but when Omega Solar came out their salesman went out of his way to recommend where the best place to put the system should be. If I trimmed back a few trees and put it on the shed I would get the best return for my money. The other 3 companies told me it had to go on the house roof! Thanks so much have told anyone who will listen that you are the best. People really appreciate the extra effort, I know I did! Wish everyone was as fast as these guys, system installed within the week, don’t want to miss out on valuable sunshine. Used to wish for rain, now I’m happy for the sun to be shining as much as it wants. In June 2011 Omega Solar+Batteries installed new solar panels at my house. Both during and after the install, Greg and his team were exceptionally helpful, providing great advice and service, and many times going out of their way to assist me in getting the best out of my solar panel installation. I cannot thank them enough for all that they have done during this process, and now look forward to enjoying the benefits of my new system. Really happy with the service provided by Omega Solar+Batteries, no pressure and did everything from my initial phone call to installation within 2 weeks. Could not fault.